The BBC is to decide whether one of its magazine editors broke guidelines by using an issue to promote his own book. 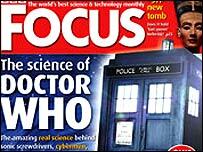 Paul Parsons devoted several pages of April's BBC Focus magazine to plug his book about TV series Doctor Who, which was featured on the front cover. A spokesman for BBC magazines said parts of the publication "may have breached editorial guidelines". The corporation's rules state that "editorial output is not undermined by financial and business interests". The BBC's editorial guidelines continue: "There must never be any suggestion that commercial or financial interests have influenced BBC coverage or the subject matter of programmes or the choice of items." The spokesman said the matter was being reviewed as "a matter of urgency" and a decision would be made when the investigation was complete. Mr Parsons' book The Science of Doctor Who is an unofficial guide not published by the BBC. He mentioned the book's title in his editor's letter and offered free copies to new subscribers to Focus. The BBC initially said the book offer was "a welcome gift to our subscribers". It added the cross-promotion of Doctor Who, which begins a new series on the BBC next month, was "an angle suitable to the magazine's popular science and technology content". "Our subscriber numbers are currently at their highest ever, in part due to the successful promotions offered to our readers in this type of offer which is linked to magazine content," continued the BBC Magazines statement. The magazine's book section also carried a prominent review of Mr Parsons' book, defended by BBC Magazines for being "peer reviewed by award-winning science fiction author, Dr Alistair Reynolds".